Canadian Parents for French » Uncategorized » New web site is now Live! 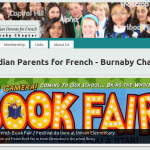 The new web site of the Burnaby Chapter of Canadian Parents for French is now live. We’re still working on improving its looks and functionality but all it’s great content is now here. Subscribe to our RSS feed of follow us on Google+, Facebook and Twitter!